training in libraries, especially as this is a key area in my current role. 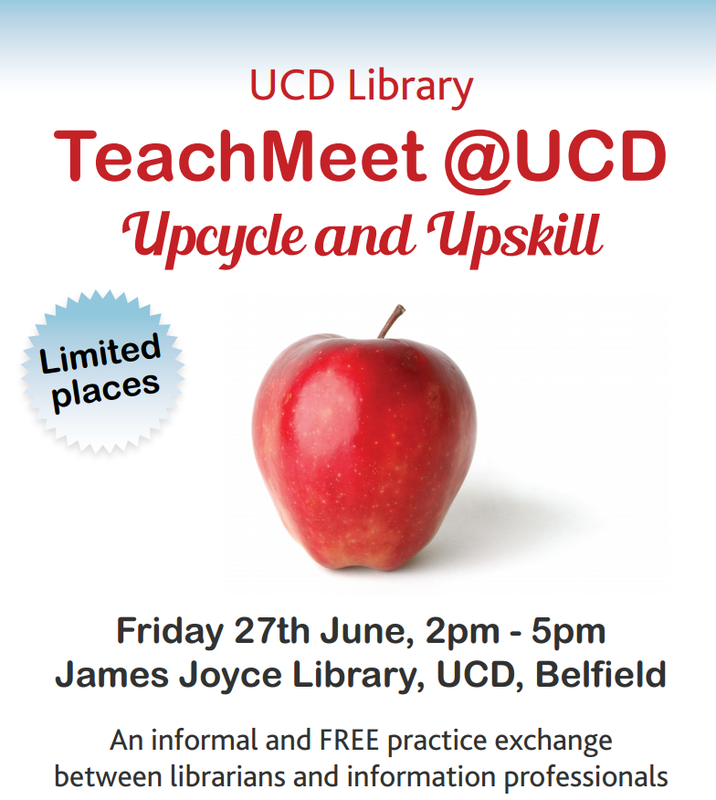 TeachMeet began with networking activities in the lovely new collaborative working space in the James Joyce Library. We then moved into a learning space for the “practice shares”, an opportunity for attendees to present on topics currently relevant to them. Gráinne McCabe from RCSI gave us an overview of the challenges faced by her team in holding “Bring Your Own Device” training sessions where library users bring their own laptops and smartphones to the sessions. BYOD presents logistical challenges such as library staff having to deal with different devices, some of which may need programmes installed. Time can be wasted getting people set up which leaves less time for actual instruction. However there are benefits in utilising BYOD for training sessions as the informal set-up of group tables and flexible seating is more favourable when compared to a traditional PC lab environment. Keeping sessions dynamic was also noted as being a key part of their success. Gráinne emphasised making the best use of the space available to you by being prepared before the session and making yourself aware of acoustics and other spatial issues. I presented the second practice share called “Rethinking Inductions”, where I gave an overview of how and why the library at Mason Hayes & Curran decided to revamp our current induction process for new trainee solicitors. Moving towards a workshop format with lots of interaction and more time for engagement was the key change in helping new trainees get the most from their library induction. The main point I aimed to convey was that it’s a useful exercise to review existing training formats even if they appear to be working well as there’s always the potential for improvement. Aisling Conroy from NCAD gave us an overview of how the Visual Resources Centre at NCAD library supports students of art and design in their research. ArtStor and the NCAD Digital Image Library provide online access to images from across the world in all periods of history of art and design, which greatly furthers research possibilities for library users. The Visual Resources blog run by the Centre promotes online resources and helps users keep up-to-date with new materials being added. Anne Madden from St.Vincent’s Hospital was the last of the presenters with the intriguingly named “Teaching the ask” practice share. She encouraged us to help our library users think critically by asking them questions which help them to learn to ask their own questions. There was also the useful reminder of keeping focused on “jobs to be done” – what the user needs to accomplish and how you can help them to accomplish it. Finally Anne suggested that an enthusiastic tone and an appearance of interest in the research or problem can do wonders in having a positive and successful interaction with our users. After reviving ourselves with tea and cake, we worked in groups to discuss “Teaching Challenges”. These challenges were submitted by TeachMeet attendees at the beginning of the event so it gave us the opportunity to engage with issues our colleagues are experiencing. After the group discussions we then shared our perspectives on the challenges with everyone at the event. Interestingly, the same topics and concerns seem to have been discussed in all the groups, which highlights that despite our different library environments, so many of the issues we face are shared. Some of the challenges discussed were teaching for future need, aiming to establish the library as a positive space, using instruction space as effectively as possible and seeking peer-to-peer feedback. It was very useful to hear how others deal with the variety of issues and was encouraging to feel that we are all working towards similar goals. Thanks to Jenny Collery, Michelle Dalton and Avril Patterson for organising such a great event – I’ll definitely be back! *Image and poster design by Melanie Simpson, copyright UCD Library. Guest post by Siobhan McGuinness - a knowledge assistant with A&L Goodbody and a research assistant with UCD. DBS Dublin Business School's library has always been very open and encouraging since I found their internship while doing my Masters in Information and Library Studies. The reassurance they provided was second to none and the advice and help given to me entering this profession was truly inspiring. I did not avail of their internship having secured employment, so I was thrilled to hear the announcement of their first seminar. The agenda was very diverse and I was looking forward to hearing all the many wonderful projects DBS library had established, as there was six different presentations I am going to focus on three as I found these particularly exciting. Firstly I shall outline Brian Hickey's presentation on "The Opportunities and Challenges of Hosting in the Cloud". This topic always interested me as there are many elements facing organisations that wish to make this move or individuals that are already availing of these many services. Brian was very engaging and brought the topic into the library profession very easily, as I have been using the likes of Dropbox and Google Doc's in college and now as work tools I can understand the advantages of cloud computing, however when you begin to think of the many challenges that face us and threaten our data it becomes a very dark cloud. Acknowledging these threats and challenges is the only way to move forward and understand the benefits that cloud computing can bring to an organisation or an individual. So what is the cloud? As I began to do my own little bit of research I came across a gem of a book called "A Brief Guide to Cloud Computing", by Christopher Barnatt, non techie and straightforward it answered the easy yet mindfully bashing question; where is this cloud? However the main issue Brian was aiming at it the many challenges that face large organisations that want to migrate to the cloud, here many took to twitter to begin a very interesting discussion. The need to know who has your data, what they can do with your data and the most important find out who they are, so many questions to be asked and so many times it seemed the answer is far from our reach which is very frightening in today's world of big data and how we freely give our data from our phones and computers through social media to these giant corporations. Brian was very informative providing a checklist of things to do prior to moving to the Cloud, two points I would like to expand on are the governing laws and jurisdictions and forensics and criminal investigations, these are very nerving points to be discussing. On an individual level using the cloud for uploading documents that contain simple information maybe you have a cookery blog, the information contained in these files would not be detrimental to the owner if this information was open to abuse, however if this individual is using the cloud and storing information that is maybe, interviews used for a government study and these files were abused then the potential of breaching the participants consent and breaching a whole other forum of ethical issues leaves the individual's credibility in shreds. The need to research Data Protection Issues is the first step if that means getting your hands dirty understanding legal jargon then so be it, it is at the end of the day your own professional credibility at stake. Next is the forensic and criminal investigations linked to the cloud, so if we were attacked an all our data abused how do we as an individual or organisation launch an investigation to tell the truth, still very much a new area and an increasingly interesting one, as there are so many different ways of a potential attack there are also many ways of investigations, as Brian nicely summed it up it is like a crime scene, who touched what, who walked where, what fell where, how did it break that way, who broke in, etc etc, which is very good after watching all those CSI episodes, but getting my head around the cloud aspect and the volume of potential suspects, it really does prove a huge feat. Brian nicely added many links for further reading which I am very grateful for. Moving onto the next presentation, is Dr Clare Thornley and "The role of Librarians in Measuring the impact of research". Dr. Thornley was very informative in the role a librarian can play in research, at the moment I am currently holding a position as a Research Assistant and find that the skills as an Information and Library Professional are perfectly matched. In an academic setting of course the need to play this role is altogether more important; however for any Librarian that is engaging in their CPD will also avail of these many inspiring and driven points. The impact research has on society can be told in many different ways, for me it must deliver a deeper meaning to society, be it a better understanding of something that we tend to brush aside or a change that will impact each individual in this generation and many more to come, from cancer research to addiction research it all has to have a meaning and change to the pool of people it is aimed at. Measuring this impact is the tricky part and it is where you as an individual will need to know if you are going to develop and continue your CPD, writing an article is fine and all, however when asked in an interview in five years' time, what impact did your research have on your profession? If you don't know well that is very embarrassing, you will need to know if it was added into other papers of similar topic or debated or challenged in ways that engaged you further. This presentation opened up new questions for me as a new Information and Library Professional, as I do hope to engage in the LIS research to develop my professional profile. Your research can bring many rewards and by showcasing your papers at the many library conferences will add to how you measure the impact, there is nothing better than showcasing your research to a room of people and then listening to their thoughts opinions and debates for you to then analyse and ponder for further study. Lastly Maria Rogers and Keith Brittle on "The Benefits of Cross Institutional Collaboration". Collaboration within this context is seen in the academic sector of libraries with Dublin Business School joining with the National College of Ireland, however collaboration works in many sectors of librarianship. Within the context of academia firstly the integration seen above is in the field of information Literacy, and how these two professionals can compare and contrast their outlines for information skills classes and how they can improve their guides that they provide to their students, as each college is similar, their libraries will have core aspects that ring through to both professionals. The benefits seen here is that instead in working in silos developing similar projects that they can now share their experiences and create better materials for their users. Collaboration is good when you have similar interests and goals, as one question was raised in the seminar how to collaborate with a library that is different from you in order to include new ideas, Maria answered it honestly saying it is easy to collaborate on something that you both are doing in your line of work so therefore the goals, interests, and achievements are already the foundations, when you are working with someone that is different it can become a teacher - learner space and goals and achievements can become too high or out of reach and ultimately may fail, not in all circumstances but it can be more difficult to maintain. This area is a great interest of mine, as I am currently collaborating with the #uklibchat team on Twitter and it is an new way of working with LIS professionals. Having an insight into collaboration has really opened my eyes and how this can really help a new professional in the start of their career. Again a huge thank you to DBS Library staff you were all so wonderful and nice and accommodating, and #librarypints turned into a very interesting evening!